SAN FRANCISCO— The U.S. Fish and Wildlife Service today announced that it is launching a full status review to determine whether the American pika, a small, alpine-dwelling relative of the rabbit that is imperiled by global warming, warrants the protections of the Endangered Species Act. The decision comes in response to a scientific petition submitted by the Center for Biological Diversity in October 2007 seeking protection for the species, followed by an August 2008 lawsuit against the Service for failing to respond to the petition. As a result of today’s decision, the pika will become the first mammal considered for protection under the Act due to global warming in the continental United States outside of Alaska. The Service’s decision comes under court order 16 months after the legal deadline. 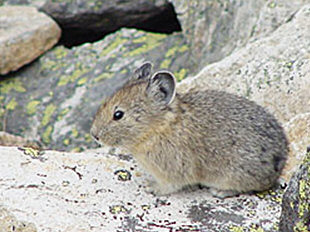 The Service is now required to decide whether the pika will be designated as an endangered species by February 1, 2010. In related news involving the pika, San Francisco Superior Court Judge Peter Busch ruled from the bench on April 16, 2009 that the California Fish and Game Commission violated state law when it rejected last spring a petition authored by the Center for Biological Diversity to list pika as threatened or endangered under the California Endangered Species Act. The ruling will send the state pika petition back to the Commission for reconsideration. The American pika (Ochotona princeps) lives in boulder fields near mountain peaks in the western United States. Adapted to cold alpine conditions, pikas are intolerant of high temperatures and can die from overheating when exposed to temperatures as low as 78 degrees Fahrenheit for just a few hours. Global warming threatens pikas by exposing them to heat stress, lowering food availability in the mountain meadows where they forage, reducing the amount of time when they can gather food, and reducing the insulating snowpack during winter. Rising temperatures caused by greenhouse gas pollution have already led to dramatic losses of lower-elevation pika populations. More than a third of documented pika populations in the Great Basin mountains of Nevada and Oregon have gone extinct in the past century as temperatures warm, and those that remain are found an average of 900 feet further upslope. According to climate experts, temperatures in the western United States in this century will increase at least twice as much as they did in the past century. This could eliminate the pika from large regions of the American West. Pikas do not hibernate during the long, cold, snowy winters at high elevations, but remain under boulder piles protected by their dense, insulating coat of fur. The dense coat that protects them in winter makes them vulnerable to heat stroke during the summer months. Pikas spend summers diligently gathering flowers and grasses and store them in “haypiles” for food to sustain them through the long winters. These “boulder bunnies,” which weigh only a third of a pound, must collect more than 60 pounds of vegetation to survive the winter. Pikas are not only threatened by rising temperatures in the summer, but also by the loss of the insulating snowpack in the winter, which leaves them exposed to cold snaps.